Mindful Self-Compassion (MSC) is an empirically-supported 8-week program designed to cultivate the skill of self-compassion. Mindfulness and compassion have often been described as two wings of a bird – we need both to soar. Mindfulness teaches us to turn toward and acknowledge our experience with a spirit of openness and curiosity. Self-compassion involves responding to any difficulties that arise with kindness, warmth and understanding. Being both mindful and compassionate leads to greater ease and well-being in our daily lives. Self-compassion provides the emotional strength and resilience so that we can offer ourselves the same kindness and understanding we would offer a good friend. With self-compassion we can motivate ourselves with encouragement, forgive ourselves when needed, face and befriend our shortcomings, care for others while caring for self, and live more authentically. Rapidly expanding research shows that self-compassion is strongly linked with emotional well-being, lower levels of anxiety and depression, healthy habits such as diet and exercise, and more satisfying personal relationships. Course fee: $525*, includes workbook & 4 hour retreat day (10% discount for students, unemployed or if you register with a friend.) You can register at the link below by making a 50% deposit to reserve your spot. Language: In English, with bilingual discussion format. Self-compassion is a skill that can be learned by anyone, even those who were not modeled compassion in their childhood or who live with a strongly internalized inner critic. Previous meditation experience is not necessary, but helpful. MSC is based on the research of psychologists Kristin Neff and Christopher Germer and is designed to reflect the same format of the Mindfulness-Based Stress Reduction program. The program combines meditation practice, body work, short talks and group inquiry to provide a multifaceted and complete program for developing self compassion and mindfulness in your every day life. What you can expect: You will be welcomed into an open and warm environment, where participants are invited to sit in a circle of cushions on the floor, or can use chairs or a comfortable sofa. Most groups have between 16-20 participants. 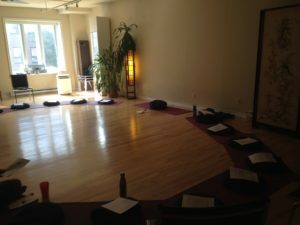 Each session begins with an opening meditation to ground and settle you, as well as introduce you to the Self-Compassion meditation we will be working with that week. Each week a new theme of Self-Compassion is introduced, which is then discussed in an interactive, bilingual discussion format and participants are free to engage at the level they feel most comfortable. Participants can share how their weekly practice is going, bring up challenges or ask questions related to the material. Some of the themes to be explored include: What is Self Compassion, Foundations in Mindfulness, Practicing Loving Kindness, Discovering Your Compassionate Voice, Meeting Difficult Emotions, Gratitude practices and Self-Appreciation. Small group discussions and writing exercise are also used throughout the program to help participants process and integrate the concepts in a profound way. During the course, participants are encouraged to work up to a daily practice of formal or informal meditations of 30 minutes per day. There is a break for tea and cookies half way through each session, as well as light body stretching led by a yoga instructor that integrates the Self-Compassion theme for that week. The 4 hour retreat day towards the end of the program is a wonderful opportunity for participants to integrate and embody the Self-Compassion practices introduced and is often a highlight for many participants! Emily is a trained teacher with the Center of Mindful Self Compassion and has received direct training under the guidance of Dr. Kristen Neff and Dr. Chris Germer. She has been teaching the mindfulness-based stress reduction group for 6 years and is excited to share her new passion for the growing area of mindful self compassion research and practice with you. Official receipts available as psychotherapist or social worker. * So that mindfulness training may be accessible to all, Emily is now offering several scholarship placements (at %30 discounted rate) within each of her 8-week courses. If you would like to apply for this scholarship placement please contact Emily. Janice Cormier is an educator and ceramic artist who has studied contemplative practices and compassion education for several years. Her goal is to work with people to cultivate compassion for themselves and for others, helping to strengthen their relationships and to foster resilience. She is a Mindful Self Compassion (MSC) teacher-in-training under the direct guidance of Dr. Kristin Neff and Dr. Christopher Germer. Janice also studied Compassion Cultivation, Mindfulness Based Stress Reduction, and the Psychology and Science of Compassion at Stanford University. She will complete her 500-Hour Yoga Teacher Training this year, and recently began leading sessions in meditation and Yoga for self-compassion. Janice has a Master of Educational Studies with interests in contemplative education, and experiential, somatic, and arts-based learning. She Janice also has a passion for the arts, and is a professional ceramic artist and sculptor. Combining her interests, she is currently exploring ways to teach mindfulness and compassion through the arts.